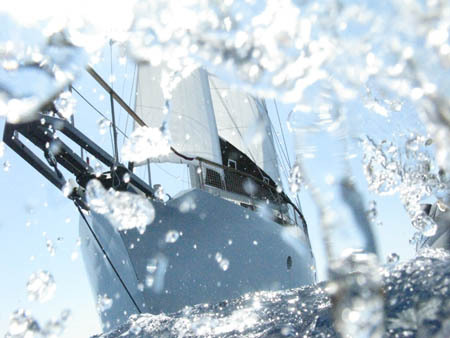 Calypso’s hull design is based on Joshua Slocums famous yacht 'Spray', built to sail single handed around the world. Such pedigree ensures that Calypso is a pleasure to sail. 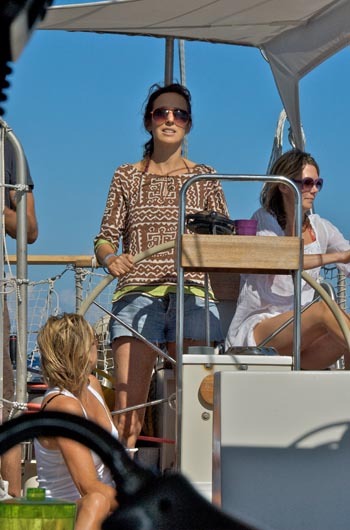 Calypso has been carefully designed to be the perfect live aboard cruiser. The old fashioned design characteristics mean that she doesn't offer modern finger-touch steering or fine pointing ability but for a live aboard cruiser we considered such racing characteristics, are secondary to providing a stable, dry, comfortable ride, with good balance and easy handling. Calypso hardly heels. Even when hard pressed. 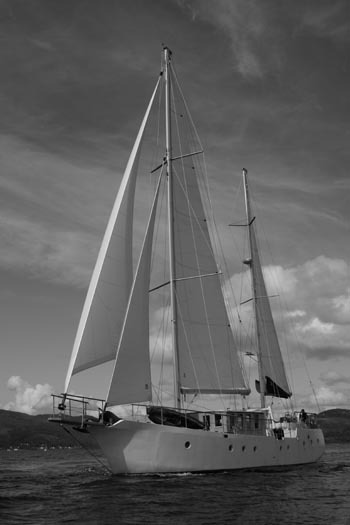 Her wide beam and 60 tonne displacement provide an extremely stable sailing platform. Excellent sea keeping capabilities. Like the original Spray Calypso delivers the sort of comfortable ride that modern canoe bodied boats simply can't match. You can put your beer down on calypso and expect it to be there when you return. Calypso keeps you dry. Her powerful flared bow ensures that she rides through troughs without stalling. Even in strong winds and short steep waves, any spray that does pass the bow is caught by the pilot house. Her shallow draft (6ft 6) means Calypso can explore shallow creeks and coves. Normally the exclusive preserve of boats under 30 feet. Solid as a rock. Her wide beam and 60 tonne displacement mean that when anchored you don't notice wind chop or wake from passing boats. A few summers ago, while anchored in Loch Craignish in Scotland a full gale, everyone down below, wood burner on, cards and whisky out, felt like we were on dry land. Calypso's long keel gives her excellent directional stability. Like the original Spray she has great balance and easy handling. If you let go of the wheel, she will normally continue in a straight line for many miles. 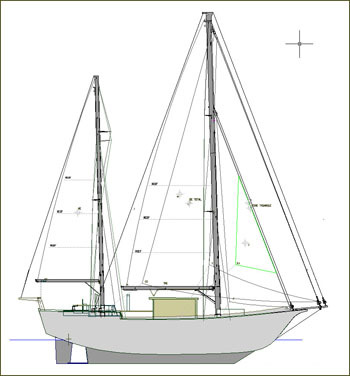 Calypso's high form stability and wide beam make her an excellent sail carrying platform. With massively over specified rigging she can carry a large sail area into strong winds, making her exciting to sail and a good passage maker. 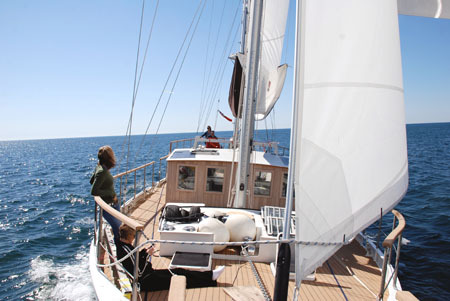 Calypso is ketch-rigged with cutter head sails: 220 square metres of sail in all. Main and mizzen are continuous line slab reefed. The yankee and working jib are on roller furlers. The jib is self-tacking. 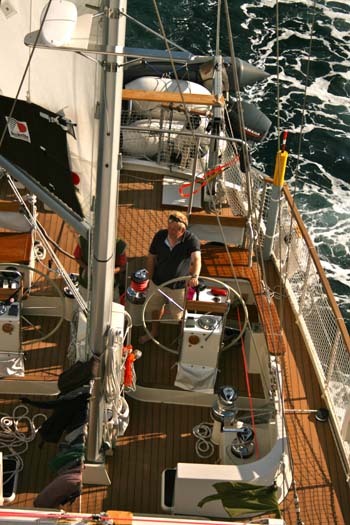 All reefing lines and running rigging lead to the Sailing Cockpit, from where Calypso can be sailed by one person. 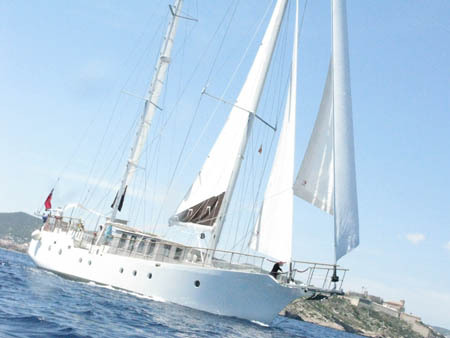 Calypso generally cruises at between 6 and 8 knots (140 - 190 miles per day on passage). Record speed so far is 12.5 knots with a following gale.